One American politician who has remained in the forefront of topical political discussions in the country like abortion rights, the environment, and climate change, health care (Patient Protection and Affordable Care Act (ACA or Obamacare), hate crimes, Trump and immigration as well as lesbian, gay, bisexual, and transgender rights is Kevin McCarthy. Due to his opinion and stance on some if not all of these, many Americans don’t like him and you can understand why. However, you will get to know more about the Republican politician here; his background and facts you never knew about the man who has been House Majority Leader since 2014. Roberta Darlene and Owen McCarthy welcomed Kevin in Bakersfield, California on January 26, 1965, into a family whose members were Democrats. His grandfather was a cattle rancher while his father was a firefighter who rose to become an assistant city fire chief. Kevin’s mother, on the other hand, was a homemaker and the McCarthy’s can be best described as a family which promotes the American dream of being hardworking. He studied at Bakersfield High School, Bakersfield, California where he graduated from in 1983 before enrolling at Bakersfield College, Bakersfield where he would later bag a bachelors degree in marketing in 1989 and a masters degree in the same discipline in the year 1994. 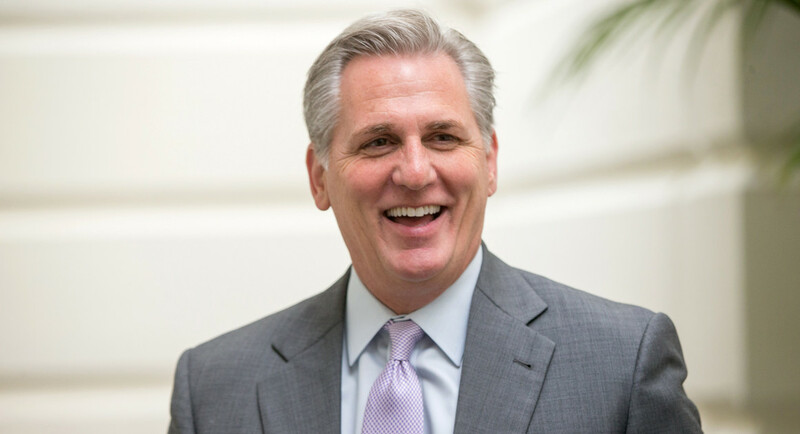 Kevin McCarthy ventured into politics in 1995 as he became the chairman of the California Young Republicans, chairman of the Young Republican National Federation from 1999 to 2001 and earlier in the year 2000, he won his first elected seat as a Kern Community College District trustee. Continuing his quest to serve his people, Kevin won the United States House of Representatives elections in California for the 22nd district as a Republican and served from 2007 to 2013. He has continued his term in office as a representative of the 23rd district from 2014 t date. The story of Kevin’s modest beginning as a small business owner has got many people endeared to him. It is said that he won a $5,000 California State lottery when he was 21. With the winning, he set up a sandwich shop which he named Kevin O’s Deli and ran it for sometime before he sold it 1987. He realized the problems most small business owners contend with every day; the hours are long but the profit margins are low because of tough business conditions. Part of the proceeds from the sale of the business was used to see him through college and graduate school. Kevin McCarthy began interning for Rep. Bill Thomas who was at the time chairman of the Ways and Means Committee and later became Thomas’s district director. In 2006, following Bill’s retirement, Kevin readily won the congress seat of his former boss. The congressman has been married to Judy McCarthy since 1992 with whom he shares two kids Meghan McCarthy (daughter) and Connor McCarthy (son). His union with his wife has been going on fine for years now though at the time he was campaigning for House speaker, there were rumors that he was having an extramarital affair which however didn’t hold much water. Owen McCarthy might never become president going by his opinion on who and who shouldn’t become president. California’s 23rd congressional district representative opines that for anyone to become president, such a person should first serve as governor. Going by this and seeing that he has not served as a governor and seems not to have plans of running for the office of governor, Kevin has no plans of becoming the President of the United States of America. Nevertheless, in the capacity he has served the hard working people of America, the congressman has done well for his people, himself and the entire American populace. See Also: Who is Rick Gates, What is His Connection To Paul Manafort, Russia and Trump? Political office holders in America are often not the richest except for some who have built up chains of successful businesses over the years or are from a family with a plenitude of successful businesses. Rep. Kevin McCarthy is respected and known for his contributions in the House of Representative and not for how wealthy he is. We all know he had a humble beginning. The congressman has a net worth reported to be between $76, 000 and $266, 000. With this estimate, he is reportedly the least wealthy of the Grand Old Party members (The Republican Party) to be elected as House majority leader.